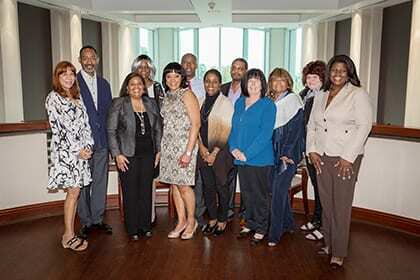 NASHVILLE, TN — Recently Minority Business Enterprise protégées from Kentucky, Tennessee and West Virginia, along with their corporate mentors, convened in Nashville at the corporate headquarters of CoreCivic. As a Centers of Excellence corporate participant and sponsor, CoreCivic serves as a mentor to minority-owned businesses like Nashville’s own SourceMark – a premier provider of innovative products, services and solutions to the health-care and retail pharmacy industry – and plays an integral part in its growth. The Tri-State Minority Supplier Development Council (TSMSDC) Centers of Excellence event included business spotlight presentations by six Minority Business Enterprises (MBEs) and two corporate mentors, including CoreCivic, followed by a Q&A session. The Tri-State Minority Supplier Development Council (TSMSDC) is a non-profit dedicated to ensuring the development of mutually beneficial relationships between ethnic minority businesses (suppliers) and major corporations (purchasers) throughout Tennessee, Kentucky, and West Virginia, by promoting and expanding business and procurement opportunities as they strive to be the product and service providers of choice.